"The Political Man of Comedy"
Jeremy Man partnered up with the multi-talented David Kilimnick in the quest of providing a home for Jerusalem comedy, putting the heart, sweat and tears into the Comedy Basement's founding of 2007. After managing the club’s everyday duties for the first year and a half, Jeremy returned to private business, theater and political activism. Jeremy is an entertainment jack-of-all-trades. 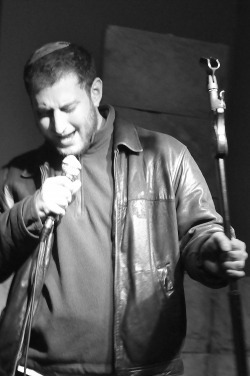 His stand-up comedy credits include "The Camel Comedy Club", "Sublime" and "Dancing Camel Brewery" in Tel-Aviv alone. Jeremy is a private party favorite, whether it is the "AACI's July 4th BBQ" or a birthday roast at the "Comedy Basement". As an actor, he has graced the stage in "The Chosen" and "History of America: Abridged", as well as television sets in "Ethics @ Work" and the silver-screen in "The Shotgun Village". Jeremy has also modeled for corporate company websites and Vered Photography. He has also worked behind the scenes as head writer and producer of "Good Food Film Company", sports field reporter for "Argaman Magazine", and director of 5 plays to date at Jerusalem's "Center Stage Theater". The former Chicagoan is happily married to Cheryl and currently lives in Meveseret Tzion. The Dale-Carnegie graduate assistant is former assistant director of NESTO (NCSY in Israel) and a proud reserve soldier in the Israel Defense Forces. A hardline conservative, Jeremy has been affiliated with the right-wing "National Union" party since 1999.